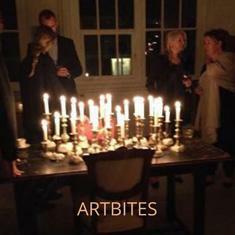 artbites: an initiative to invite-delight-excite-ignite the senses. A dinner, luncheon or cocktail event in a space where you are surrounded by Art. The conversation happens, just because. The first collaboration was together with the creative team behind People’s Place. It was an opportunity for Chef, Otto Nout and crew, to let their creativity go crazy. He made a visit to the studios, a different space for each course, and was inspired by the artwork and ambience of the different studios and created a site-specific menu. Amazing!